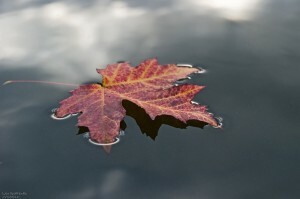 What path will a leaf follow floating down a turbulent stream? Is it even possible to make a mathematical model that will predict such motion? Is this the same sort of problem as predicting the path of planets as they move round the sun? Even when we know all the rules governing the motion of an object, and can determine precisely the initial conditions, it turns out that some motions can be predicted and some cannot. And it is not just a matter of complexity: we can model unpredictable systems with very simple equations. In this Vignette we illustrate mathematically the existence of chaotic dynamical systems using the decimal form of real numbers. You will see how the unpredictability can be simply generated. One of the main goals of theoretical models is to make (good) predictions. However, there are deterministic dynamical systems that in practice are unpredictable; they are the so-called chaotic systems. The aim of this text is to discuss how this unpredictability is generated, and the main tool here will be the decimal representation of real numbers. By a deterministic dynamical system we understand a mathematical model with a well-defined (time) evolution rule, in such way that if it is known how the system is configured at the present time, then it is possible (theoretically, at least) to know how it will be configured in the future. A basic example of a deterministic system is given by a (unique) planet around a star; the mathematical model is Newton’s Second Law of Classical Mechanics, and the initial configuration is the position and velocity of the planet at a certain instant of time; from this it it possible to exactly predict its future configurations. With respect to chaotic motions, there are different definitions spread in the specialized literature. At least in one point different authors agree: chaotic motions do exist. In the world of models the term chaos has been used as synonymous with erratic, turbulent, unpredictable, random, irregular, etc., and it has often been observed through numerical simulations and laboratory experiments. Such the term in deterministic systems was popularized by T. Li e J. A. Yorke in the title of a work published in 1975, but its meaning in this context was not the one presented in a dictionary. A familiar example of chaotic motion is given by a small leaf in turbulent water flow. Complex behavior in dynamical systems does not require complicated equations! In the following this advantage is used in models based on the decimal representation of real numbers. Thus, the first step will be a short analysis of such representations, before the presentation of the models. The readers are invited to use pencil and paper to check some of the steps ahead. The real numbers in the interval are classified as rationals and irrationals. The rationals are those that can be represented in the form , with natural numbers and , and . The rationals, when represented in the decimal form, are exactly those with a finite number of nonzero digits or with blocks that repeat indefinitely, the so-calledrepeating decimals. As examples consider and ; it is also possible to occur situations like , which are called repeating as well. The irrational numbers are those whose decimal representations present infinitely many nonzero digits but with no infinitely-repeated portion as in the repeating decimals; maybe the most famous irrational number is , so that is also irrational and belongs to . and the digit says that is, among such subintervals, in the sixth. Since all remaining digits are null, for all subsequent subdivisions this number is always in the first subinterval that starts at , and it is uniquely determined as the lengths of the subintervals in this process tend to zero. Some numbers have more than one decimal representation, more precisely two. For instance: It is possible to be convinced of this by analyzing the closed subintervals that contain (i.e., always in the last subintervals – those ending with ), or reasoning as follows: if , then and , so that . 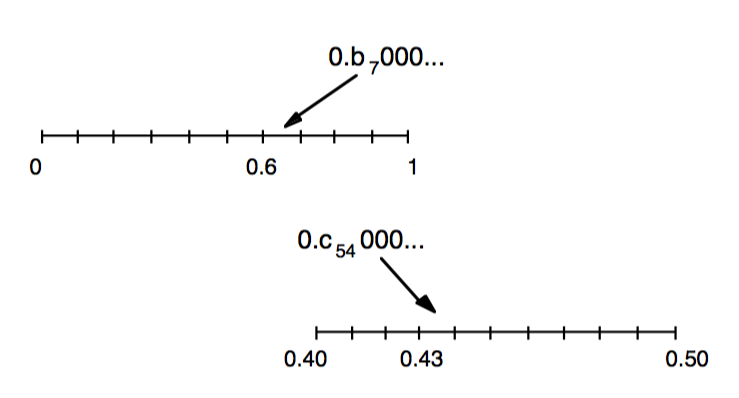 These possible doubled decimal representations only occur with repetitions of from a certain position (this is not obvious and asks for a detailed proof that will not be discussed here); below such particular representations will not be considered, so that uniqueness of representation are then guaranteed for all real numbers. By using these remarks about decimal representations, sometimes it is possible to construct numbers suitable to certain purposes; it is enough to choose successive subintervals in a convenient way. This will be fundamental in what follows, in particular in the description of the system with chaotic properties. As already mentioned, in dynamics the term chaos refers to behaviors that in practice are unpredictable, although generated by deterministic systems. But how is this possible? Let’s pass to the discussion of two dynamical systems that, at first glance, may seem similar. The two models are deterministic, the first one does not present chaotic motion and also serves as a warm up, whereas the second one has a richer dynamics. Even though such models are not necessarily directly related to physical situations, they are important by their simple evolution laws, so permitting that their dynamical characteristics may be easily understood. This first example does not present chaos, and will be referred to as regular. 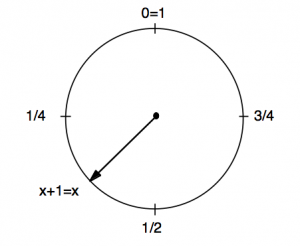 Its possible configurations are points in the interval with a small modification: the end points and are identified and the interval becomes a circle (think of a rope with the ends glued together). 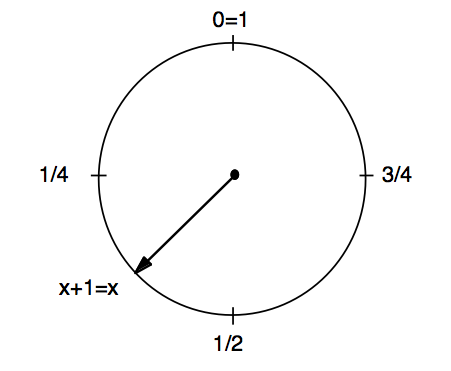 The general rule for working under this identification is simple: if a number is not in , subtract its integer part, which corresponds to the number of full turns around the circle and then returning to the same point (see Figure 1); as an illustration, in case of , the integer part means three full turns that do not modify the configuration of the system, that is, . We also see that the numbers , , and represent the same configuration “ ”; says that stating at we have gone one full turn; that we have gone exactly full turns, and so on. The temporal evolution is given by a deterministic law; if the initial configuration of the system (it is always supposed to be given at instant ) is , then at instant one the system will be at , at instant two in , and at a generic instant at . It is expected that a deterministic system reaches some kind of equilibrium for large times, which in mathematical language corresponds to take the time “going to infinity”; in symbols . In this example, for large its successive configurations approach zero, and for all initial conditions ; for example, if , then , , etc. The equilibrium is always described by the position zero. It is in fact a regular system. In this subsection a mathematical model with chaotic behavior will be presented. It is a simple adaptation of a well-known system among specialists. The possible configurations of this system are the same of the previous example, that is, an interval with ends identified. The temporal evolution is given by the following law: if is the initial configuration, then at instant the system is in , at instant in and, in a generic instant in . The identification of end points is assumed at each instant of time; thus, if , then and . Here we clearly have a deterministic system as well. It is a good idea to doubly illustrate how to compute the orbit of a initial condition, say : , , , and so on. Next some possibilities of equilibrium for this system as are discussed. If , or , we have , and the equilibrium is described by the position . If we have . Similarly, for , it follows that for all . From such cases we see that if is any rational number in whose decimal representation has a finite number of nonzero entries, then the equilibrium will always be described by the zero position. In the case of rational numbers represented by repeating decimals, in general the equilibrium is represented by a periodic orbit. Some examples explain the meaning of a periodic orbit in this context. In case we have , ; hence, whereas , and the equilibrium is described by an orbit of period given by . If , the equilibrium is a periodic orbit of period , that is, , for (and if and in ). The same idea is applied to present examples of orbits of any period. If the initial condition is an irrational number, the equilibrium may be more complicated, there are many possibilities and it may be difficult to describe in some cases; however, undoubtedly it will not be a periodic orbit (since its decimal representation is not repeating) and some possibilities will be discussed ahead. An effective way of estimating the distance between two points in , when given in decimal representation, is to count, from the decimal point, how many successive digits coincide. For example, if and , their distance is less or equal to . Now, if represents a digit in and given an initial condition , there exist initial conditions that generate periodic orbits arbitrarily close to (it is the so-called density of periodic orbits). The new initial condition corresponds to a periodic orbit of period whose distance to is less or equal to (if necessary, use blocks , with ). Proceeding in this way, one gets periodic orbits with high periods whose initial conditions are arbitrarily close to . On the other hand, has zero as its equilibrium and its distance to is less than , whereas corresponds to an irrational number whose distance to is less than . belongs to ; note that can be used to localize close to any given number. by dividing into ten subintervals as before, belongs to the first of these subintervals, to the second, , and to the last one. For example: . divide each of the above subintervals into ten, so getting one hundred subintervals. Chose so that belongs to the first of such subintervals, to the second, , to the last one. For example: , and . Proceeding with subdivisions as above, it is possible to obtain initial conditions that, under time evolution, visit “all parts” of . By all parts it is understood any subinterval of ; the precise technical term is to say that the orbit is dense in . This follows by observing the orbit of ; for instance, it will visit when it reaches , and so on. This behavior (that is, to visit all parts of ) would be the “equilibrium” of this orbit as . It is interesting to note that each one of the blocks can be chosen among many possibilities, which shows that the orbits of infinitely many initial conditions visit all parts of through time evolution. There are other possibilities and the readers are invited to exercise their creativity! Think, for example, of initial conditions whose orbits visit all parts of just the interval . With respect to the above initial condition , recall that can be selected in such way that is very close to any given point of . Thus, there are initial conditions whose orbits spread out all parts of that are arbitrary close to any given periodic initial condition, and also close to initial conditions whose equilibria are described by the position zero. There are, then, at least three types of equilibria whose corresponding initial conditions are intertwined. It is also possible to consider periodic orbits with different periods as distinct types of equilibria; this is left to the taste of each author. Hence, in this example, in contrast with the previous one, different initial conditions may present different kinds of equilibria. What is still missing to characterize the chaotic motion? Surely such different intertwined behaviors give a flavor of unpredictability to the dynamics, that is, very close to an initial condition there are infinitely many others with different equilibria. Here is another essential ingredient: in practice any initial configuration is known with limited precision, because there is always an experimental or truncation error. In physical systems, besides the limited accuracy of the initial data, there are also small external disturbances which may occur, such as variations in temperature, etc. The picture is now complete: there are very distinct kinds of temporal evolution, whose initial conditions are arbitrarily close to each other, and with the limited accuracy of the initial data, no one knows what kind of equilibrium will be attained as . One of the ingredients for the chaotic behavior is the expansiveness, that is, near points are quickly separated by the temporal evolution (which does not occur in the first example above), and in this example, at each instant of time, the distance between two close points is multiplied by ; this is called sensitivity to initial conditions. As an illustration, suppose that the initial condition is with precision of a millionth, that is, assume that it can be anywhere from to . By the temporal evolution, at time this range of accuracy will be multiplied by ten and will have length , at instant length , and the instant length , but the latter is the length of the interval . Thus, after only instants of time, every point of could be describing the system. It is chaotic! With more sophisticated mathematical tools, one sees that the temporal evolution of the “majority” (i.e., except in a set of “null length”) of initial conditions in this example behaves as above, whose orbit is dense in the range ; thus the ad hoc initial condition , in fact, is far from being an exception. The examples above were defined in terms of a sequence of symbols (in this case ) associated with the decimal representation of real numbers, dynamics was postulated and the mechanism of dynamical chaos was apparent. It is interesting to note that with tools of current mathematical research, the chaotic behavior in some more sophisticated deterministic dynamical systems, modeling physical phenomena, can be visualized (this is usually not a simple task) in a way very similar to that described above. The basic principle is the same: existence of a region with (1) periodic orbits arbitrarily close to any initial condition, (2) the presence of dense orbits in the region, and (3) sensitivity to initial conditions. It is clear that the notion of visualization employed above should be given precisely, but the goal is to obtain dynamical properties based on symbols as illustrated above by the decimal representation. There are several aspects of chaos that are not covered in this text, such as their links with fractals, noninteger dimensions and ergodic theory [2,6], but the goal here is not a detailed review of the subject and is strongly influenced by author’s preferences. In some situations the presence of dynamical chaos is unfavorable: it can interfere with a good weather forecast, can be responsible for planetary instabilities, cause aerodynamic instabilities, among others. On the other hand, there are studies pointing to chaos as the mechanism responsible for the smooth running of various animal organs such as the heart and the brain. Thus, naturally one asks: how can chaotic features turn out to create some kind of stability responsible for the smooth running of something? And, particularly in the case of the brain, how is chaos is in charge of frequently produced original patterns? Certainly the situation is richer than predicting a floating leaf and there are still many applications to be detailed and understood. Acknowledgement: I thank Prof. Mário J. D. Carneiro for providing his text on the subject, and CNPq. Originating author is César R. de Oliveira, Universidade Federal de São Carlos. J.-P. Eckmann, D. Ruelle, Ergodic theory of chaos and strange attractors, Rev. Modern Phys. 57 (1985), 617–656. J. Ford, How random is a coin toss?, Physics Today 36 (4) (1983), 40–47. J. Gleick, Chaos: Making a New Science, Penguin Books, Revised edition, 2008. W. M. Hirsch, S. Smale, R. Devaney, Differential Equations, Dynamical Systems, and an Introduction to Chaos, Second edition, Academic Press, New York, 2003. D. Ruelle, Chaotic Evolution and Strange Attractors, Cambridge Univ. Press, Cambridge, 1989. S. Spezamiglio, W. F. Pereira, Ordem no caos de Devaney, Matemática Universitária 35 (2003), 31–40.